There are 6 sizes (S/M/L/XL/XXL/XXXL) for the following listing. Lightweight But Durable Lightweight material with good workmanship and stitching, guarantee the daily use. Suitable for kinds of outdoor sports. 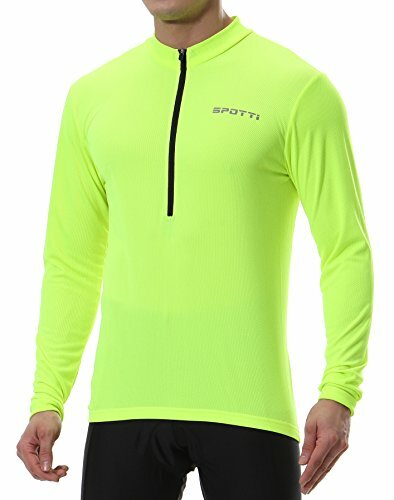 High Visibility Keep your safety in mind, we put reflective print logo on the front and back, makes you highly visible at night and in low light environment. Easy Wear and Better Fit Pulling down 12'' zipper, it's easy to wear and can let the wind cool down the heat. Elastic hem keeps rear in place to better fit. Take Any Essential You Want 3 rear pockets can stash pump, repair tool kits, tires, phone, food or clothing for change, don't worry about hunger or flat tire on the road. Maintenance: Handwash with warm water only. Do not brush or bleach it as it compromises the quality of your jersey. 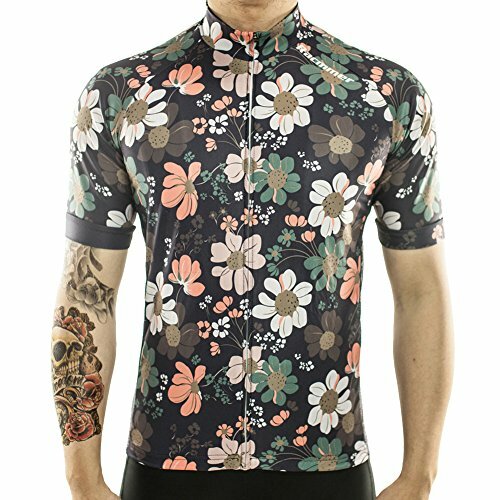 Are you looking for a cost-effective bike shirt ? High-Wicking Made with advanced breathing fabric, maximums the ventilation and provides effective moisture wicking ability. Easy Care and Easy Wear Vibrant Dye-Sublimation printing keeps colors bright and true after wash and wash. 12 front zipper is easy to wear. Three convenient REAR POCKETS (with elastic closures) for storing essential gears. Elastic hem keeps rear of jersey in place as you ride. The spring is on the way now!! 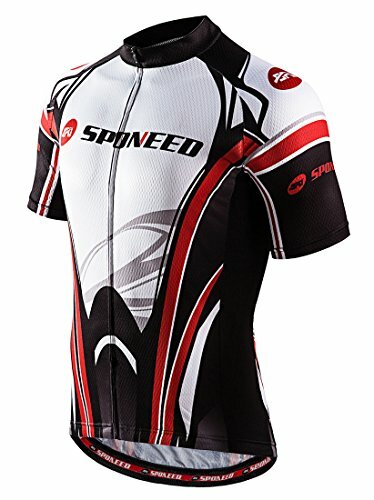 Are you ready to take off the heavy cloth and put on soft and light cycling jersey to enjoy a carefree long ride? Or do you lack one and need a brand new one? KORAMAN now offers a brand new design jersey for the US customers. The size is SPECIALLY customized according to the US STANDARD SIZE. 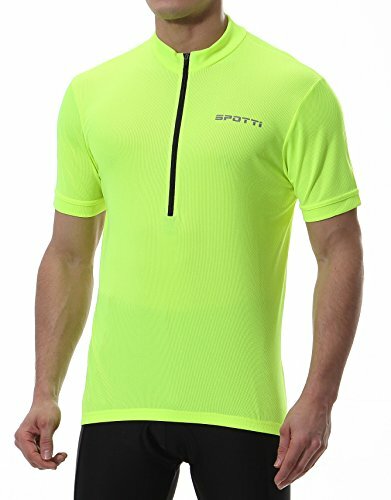 It is knitted by soft light mesh fabric which is moisture-wicking quick-dry and breathable to keep the skin cool and comfortable all the way. 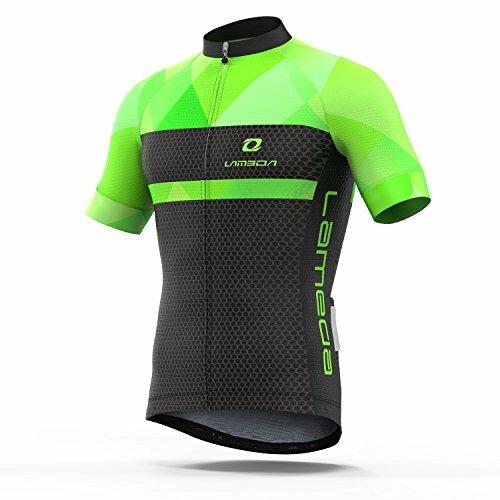 It makes the jersey perfectly suitable for riding bike, MTB riding, or even running climbing hiking. There are 3 big elastic rear pockets with 1 zipper pocket to securely store the wallet, keys, water bottle and big smartphone without worrying loss. The hem is elastic with silicon band to hold it in place while cycling. Also, there are reflective logos in back, front and arms to increase the low-light visibility to keep safe. WARRANTY : your satisfaction is our biggest goal. Any dissatisfaction, return free or 100% money back. S : front length 24.41", back length 27.56", chest 38.98", sleeve 13.19"
M : front length 25.20", back length 28.35", chest 40.94", sleeve 13.78"
L : front length 25.98", back length 29.13", chest 42.91", sleeve 14.37"
XL : front length 26.77", back length 29.92", chest 45.28", sleeve 14.96"
2XL : front length 27.56", back length 30.71", chest 47.64", sleeve 15.55"
3XL : front length 28.35", back length 31.50", chest 50.00", sleeve 16.14"
1,Bike jerseys are great fitting functional cycling shorts pants with the 3D gel sillicon. 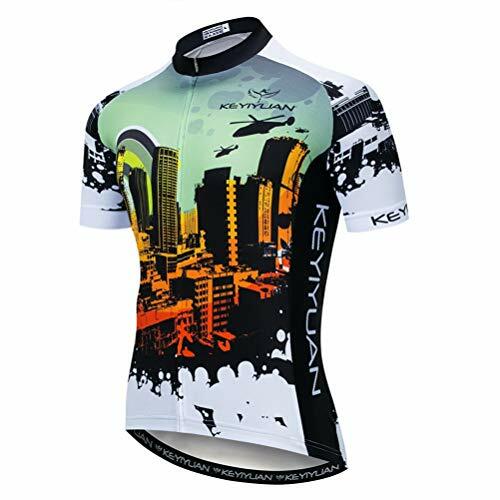 When cycling, your sweat will be quickly absorbed by our jersey and it will dry soon. 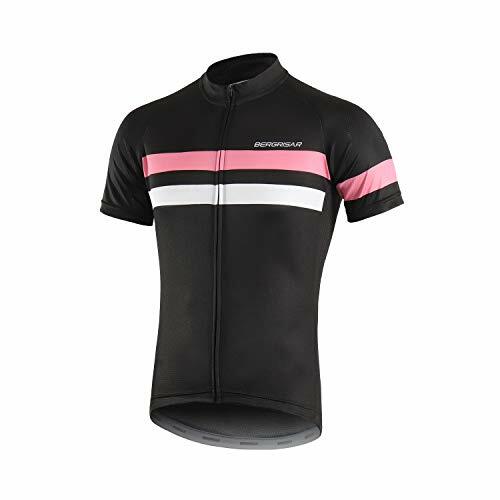 The jersey gives you the most comfortable fit to help you enjoy cycling. And the top quality fabric will offer you with excellent air breathability. 4 pockets for storage when cycling,includ one zipper pocket(enough for 6 phones), you can put wallet water cellphone ect. Elastic hem make sure the jerseys tight and never move when cycling. 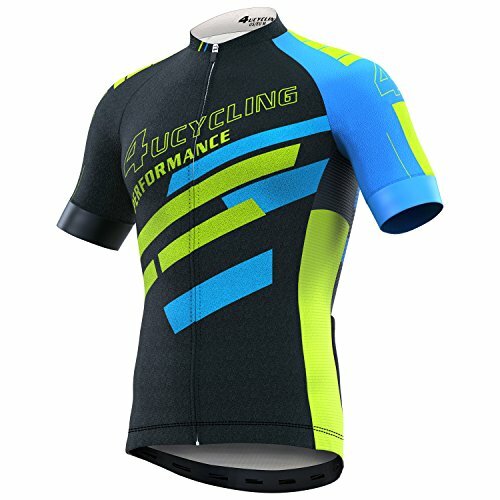 Are you tired of your everyday flat and dull cyclIng jersey designs? Are you bored of wearing jerseys from sponsor brands? Aren't you tire of the thickness and non breathable jerseys lowering the quality of your ride? Sorry ! I am late! Every single jersey from us is sophisticated designed by the professional team RACMMER, with the most up-to-date trending. 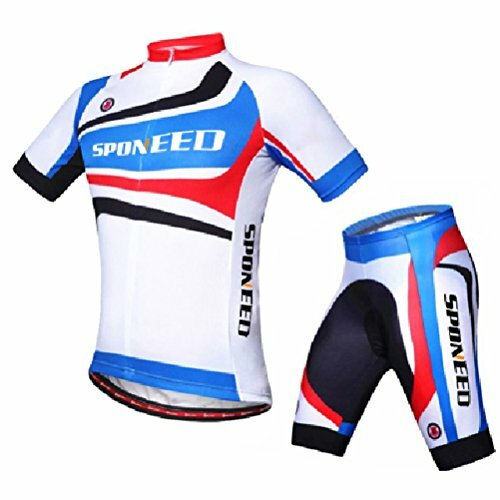 -Material: 100% Polyester, use more breathable, quick dry, elastic and ultra light material, one piece of jersey just 155g(size L),Suitable for kinds of outdoor sports. meanwhile, according to human body engineering use suitable materials to make it more dry and comfortable. -3 Pockets: Classic big and deep 3 pockets at the back, easy for holding items. -Silicone Hem: black silicone band, can prevent skin allergy and the cloth upglide during riding very well. -High Quality Zipper: customized zipper, has passed the stringent testing required to prevent from getting stuck and riot crack. US size,but maybe runs small.please check our size chart before order,or contact us for suggestions. 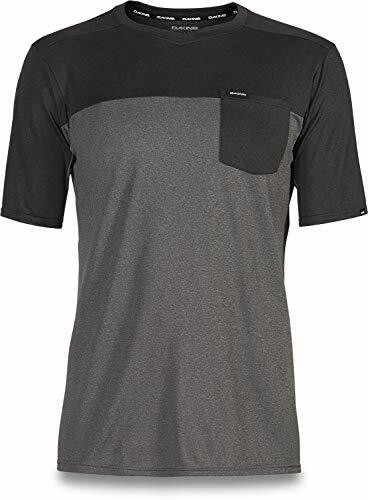 100% polyester,Moisture Wicking,drying fast,breathable,cool feeling. 3+1 zipper pocket for safe storage,you can carry whatever you want.with reflective stripe for darkenss safety. US size with silm fit design,for more details can read our size chart for size suggestions. Elastic hem with gel gripper,confortable and tight when cycling. 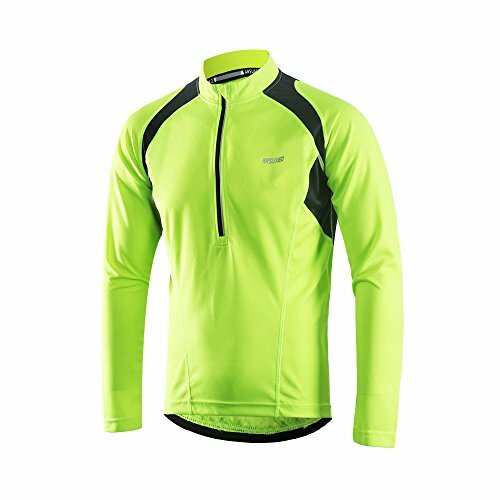 Light weight,comfortable,soft fabric,with bright colour,surely it will be a durable and idear cycling jersey. SIZE ATTENTION: Size may run smaller than US size, please view the size chart on the product image, product descriptions or contact Uriah Customer Service before ordering. -Comfortable Fabric. 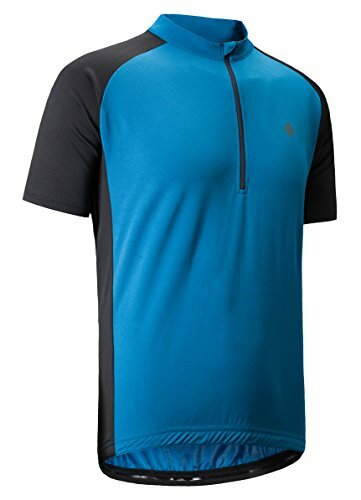 Breathable comb mesh fabric with the moisture wicking ability, keeps your body cool and dry. - 3D Fit. It makes the shirt greatly fit your body. - Reflective Stripes. The stripes on back increase the caution effect at night riding. -Low Hem Gripper. Prevent the jersey riding up. Back panel and side panel adopts honeycomb shape fabric, could release sweat quickly, keeps your body cool and dry. 3D fit. The slight elasticity is comfy, moderate fit your body. Could reduce the windage effectively. Thermal transfer printing. Great permeability without fade. Low hem gripper. Prevents riding up when riding. Back penal reflective stripe. Increase the caution effect at night riding, more safe. Professional mesh fabric: 100% polyester fabric. 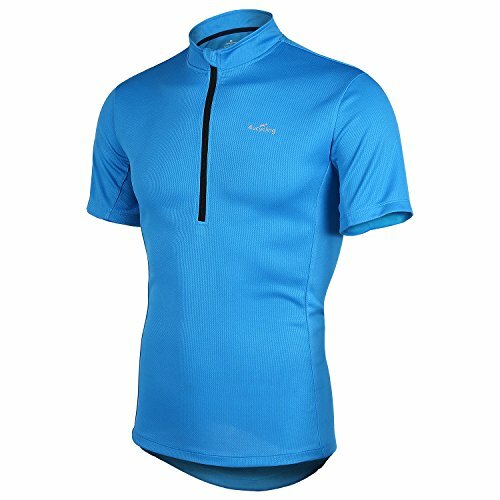 Upper jersey adopts mesh fabric which has lots of thin holes, features breathable and moisture wicking, keep your body cool and fresh. 100% polyester fabric is of good elasticity, thin and soft, fits your body perfect. Anti-slip. The lower hem of jerseys and the leg opening of bib shorts with gripper, which prevents the cloth from slipping. Lycra fabric of bibs. 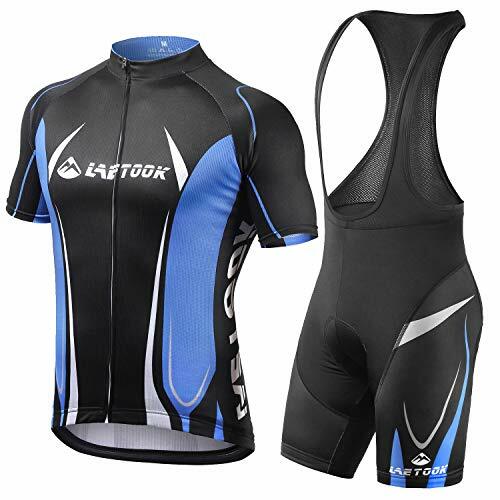 The bib shorts are made of Lycra fabric, which is of strong elasticity and makes you feel comfortable. Anti-shock. 3D Gel pad inside the bibs and foam will weaken the sense of shock and allow your skin breath freely, make you comfortable for a long time riding.